At Somerton is a new YA historical romance series. I wrote it based on an idea from Emily Meehan at Hyperion. The first book, Cinders and Sapphires, is available in the US from Hyperion and in the UK from Hot Key who have re-titled it Secrets and Sapphires. It’s historical romance set in the years around the first world war. Book 2, Diamonds and Deceit, is forthcoming in Jan 2014. There is a third book: Emeralds and Ashes, set during the First World War. Due to a publisher decision, this is only available through Barnes and Noble as an e-book . 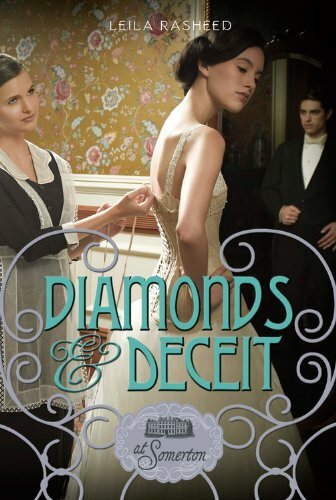 At Somerton Book 2: Diamonds and Deceit. I loved Cinders and Sapphires and can’t wait for Diamonds and Deceit! Thanks! 🙂 Yes, there is – I have the chapter plan open right now on my computer but I’m giving nothing away 🙂 (ok, just a bit – it’s set during the First World War and it’s called Emeralds and Ashes). I have your novel won by a reading round on the website “LovelyBooks”, do you know what that is? I don’t know, if the Englisch word is right. Anyway, I’m looking forward to submit a review for my book blog so all my followers can read my high opinion of your book. So, now I’ve been babble enough! I’ve just finished reading Cinders and Sapphires, and absolutely loved it! I cannot, absolutely cannot wait for Diamonds and Deceit to be released!! I would just like to ask if you’d allow me to interview you on my blog? I hope you’re interested, and maybe it can be a promo prior to the release of Diamonds and Deceit! I do hope you’re interested, it would be such an honour to interview you! Hi, thanks so much for your message. I’m really glad you loved C&S! I think D&D is out in January so hopefully not too long to wait :). I’ll email you about the interview. Thanks again, it is lovely to know readers are enjoying the books. I love your Bathsheba series I think they are so cool! Please please write another one I love them, they are by far the best books you have ever written. I am waiting in anticipation for you to write another one! I hope you do soon I am your biggest fan your books are amazing! That’s great advice and gives her plenty of things to think about! Thank you very much. Thank you so much! I can’t wait 🙂 good luck writing! I am currently a sophomore in college, I do realize I am much older than the regular audience, but I couldn’t help but read your Somerton series after reading a summary over it. It is a very interesting series and much liked, it contains quite a resemblance to Downton Abbey, which is probably a qualifying factor. Narrating several characters must be difficult to keep a track of, but having the text be in third person was rather brilliant, but then again you must know that, and it was only logical of course. I am a huge fan of fictional books, even though I am a biology major. I don’t pretend to know you, but you seem to be a fan of cliff hangers, considering the second book was filled with them, you could even say there was a cliff hanger at the end of every chapter. The foreshadowing was brilliantly done, leaving the audience with questions and loose ends that would be sewn to produce a picture close to the end of the book. I have read some of the comments posted above, and I read the mention of a third book to the series, and probably the final book also. I am excited to read it! I was wondering if a date has been set for the release yet, or if it is still in the writing process? And are there any details that you could leak, about Ada? I am very curios to see what has happened with her and Ravi. Thank you for your message. I’m delighted you enjoyed the series, it is always lovely to hear from readers. The third book is still being written – I am about one third of the way through – and I don’t yet know the publication date. I expect it will be January 2015, though. I have just finished reading D&D in less that a day (I was hooked)- it was amazing, even better than the first book and I cannot wait for your third. You are a great writer and I am longing to know what happens! Hello! – Er– My name is Lori and I’m from Romania. You probably didn’t think that someone from over here could be so interested in your At Somerton series. I learn both English and German at school and my parents gave me C&S in German, so I could improve my language. But it was more dificult to read it in German. Because I liked very much the prologue, I decided I had to read the entire book. So I ordered it from USA and the 2nd one (D&D) from UK. It took about 8 months to have them both. It may seem strange to write all this to you, but what I wanted was to show you how much I appreciate this series, even if it’s more difficult for me to have them! I have just finished Diamonds and Deceit and it was absolutely perfect! I’m very exited about the last book. I simply cannot wait for it! And I also have a small question (Of course, only if you would like to reveal us this secret :D). Who is the most important character in the 3rd book? I mean, book 1 focuses more on Ada, and book 2 on Rose, but who is the main character in Emeralds & Ashes(if I got the title well)? Thank you very much for this wonderful series and good luck further! I am still quite excited that I am writing to you 😀 but I’ll stop here. I don’t want to sound that pathetic. Hello again. Thank you for answering my question. Now I am even more nervous about the last book 🙂 I can only hope that time will past quickly! Thank you! 🙂 Well, I find the period very interesting – so all those changes and tensions are very inspiring. I’m writing the third book which is the last one I have a contract for, at the moment. That is set during the first world war and I’ve found that particularly rich and interesting to delve into. There are so many wonderful books on the period. I enjoy reading first hand accounts such as Vera Brittain’s memoirs and Frank Libby’s ‘Horses Don’t Fly’ – all those are very inspiring. Thanks again for your kind words and I wish you the best with your own writing. These books are just amazing. I am actually marking the calender until the third one comes out because I cannot wait! I am so concerned about the future of these characters. January needs to come now. 🙂 Just sent off the copyedits! Hi Leila! I was wondering if Emeralds and Ashes would be available as a physical copy in the United States? I just went to the barnes and nobles website to pre order it but it only seems to be available as nook book!! I would be terribly sad if this was the case because I do not have a nook and have been waiting a whole year to find out what happens next in this great series! Oh no! I have a book but I need a copy of this book. I hope that worlds out. do you know if there will be a UK paperback edition from the other publisher? Good question! I don’t know but will email my agent. Aww that’s dissappoiting I’m sorry:( I will be sure to order it from the UK then so I can have matching, pretty hardcovers!!! Thanks anyways!! Hi Leila! I am so disappointed to hear about E&A not being published as a physical book (in the US). I loved the At Somerton series, and as a school librarian I have other students that have enjoyed it as well. I will personally make sure to purchase the ebook version to make a point for your publishers, but really wish I could get a phyisical book for my school library! Keep writing, please! Honestly Emeralds and Ashes was everything I wanted and needed from a third book. Everything was wrapped up and it didn’t feel rushed. That being said I would like about twenty more books in the series. Hi Leila. I am an eight grade student and am working on a project using your book, Cinders and Sapphires. My project is about facing history through literature. My topic is England in 1910. This is why I read your book. I am looking into this period, particularly women’s education and women at Oxford in 1910, using your book as a jumping off point. While doing research I have not found much about this topic and was wondering, where did you find your information for writing Cinders and Sapphires? If I’m in the UK does that mean I can’t buy emeralds and ashes? I am almost fourteen and am aspiring to be an author of historical romance. I absolutely adore your two books (I have Emeralds and Ashes on order) and was wondering how you came to be a historical romance author? Are you interested in history? And have you ever thought of writing a sci-fi or modern-style book or have you always wanted to write history? Is there a way to contact Hyperion to ask them to publish Emeralds & Ashes in hardcopy format? i have read both books in the series from us when is the third book coming out? Hi, I have read sapphires, and ordered two more books. Your books are amazing, easy to read, interesting with great characters within. I would love to know which order I should read them. what was the 1st 2nd and third and is there any more on the way. My daughters loved your Turlingham Academy books and have read all 5, do you have any plans to write any more in this series? I’m from the UK and am trying to buy your Emeralds and Ashes book. I’m just wondering when the release date is? On some sites it says it has already been released and on others it say it is waiting for release. Hi, Leila. I have the first two books of your At Somerton trilogy (I’m a huge Historical fiction nut, by the way), but I don’t have Emeralds and Ashes. Is it really only available as an eBook in the U.S.? Because I’ve searched literally EVERYWHERE for it. Please let me know. Hi Leila! I really enjoyed the first two books in this series! Can we expect a third? I am sorry for the fact that it’s hard to get hold of, not something I have any control over sadly. i love it, the drama, the different plot lines, the characters, everything. i never saw any second or third when in the stores but i’m glad i looked it up and that there are mooooore! anyways i just love it. Hello. I really like your books from the series Witch of Turlingham. Therefore, I want to ask and will continue this series ie sixth part.